BACKGROUND: Neurodevelopmental Therapy (NDT) in conjunction with other therapy approaches offer a forward-looking interdisciplinary problem-solving approach to the treatment and management of any individual with a central nervous system disorder. AIM: The aim of the pilot study was to establish the effect of Combined Therapy Approaches (CTA) on the intervention of four children aged 48.1 months to 60 months with Cerebral Palsy (CP). Repetitive learning processes of CTA during task specificity activities provide an overview of the impact of high dosage intervention for children with CP. RESULTS: The success of the intervention was confirmed by the positive results obtained on the Goal Attainment Scaling (GAS). CONCLUSION: Intensive task-specific training showed to be beneficial for the children, resulting in improved developmental domains for the child with CP These findings emphasize that evidence-based treatment-intervention approaches for children with CP should be applied including traditional NDT/Bobath. Despite the widespread use of Neurodevelopmental Therapy (NDT) in paediatric practice, the short- or long-term benefits of this approach have not been systematically investigated. NDT is an approach used for children of all ages with Cerebral Palsy (CP) who present with sensory-motor-perceptual and communication dysfunction1. Authors of meta-analytic reviews2 report positive trends, but conclusive evidence on the efficacy of NDT for the improvement of activity and participation is still to be established. Standardised guidelines as well as a fidelity measure for NDT intervention will aid in determining the effectiveness of this approach, which is still questionable according to Paci3. A review by Novak, et al4 also highlighted the lack of a sufficient evidence-base for the continuing adaptations of the NDT/Bobath approach that have been applied by therapists across cultures and continents for the past 70 years5. Therefore, an eclectic approach which includes theories of motor control, task-oriented approaches and evidence-based interventions, was used in the intervention of children with CP The aim of this pilot study was to provide an overview of an intervention protocol for children with CP using high-dosage Combined Therapy Approaches (CTA). It is hypothesised that the protocol will lead to functional improvements in children with CP. The Bobath/NDT concept was initially based on the hierarchical model theory, but has since shifted to the current systems theory. This change enables the emphasis to be placed on a balanced distribution of the control of behaviour among interactive neural and body systems that are spontaneously organised by the task parameters in the context in which the task intentionally occurs6. The NDT approach offers an interdisciplinary, problem-solving approach to the assessment, treatment and management of any individual with limited abilities, to fully participate in daily life. Central nervous system (CNS) disorders can impair motor (including tone and patterns of movement), sensory, perceptual, communication and cognitive function4. The NDT/Bobath concept relies on the observational, analytical and handling skills of the therapist which in most cases cannot be quantified. Since the chosen interventions are uniquely designed and implemented for each individual, it is not an operationally definable concept. Every effort is made to activate and stimulate spared neural mechanisms and to stimulate the child to use affected body parts and sensory-perceptual pathways. Stimulating the child in this way aims to drive neural plasticity and minimise learned developmental, non-use or neglect in all domains7. Quality remains important; it is however, never preferred to function, for when a child's movement can't be improved, function should not be compromised8. It is believed that the child's potential is identified by tasks that can be executed with only a little help9. It is important to focus on the potential of the child and further enhance it with specific intervention. To estimate what 'a little help' is, the therapist uses preparation, activation and repetition with task-specifics with or without facilitation from distal or proximal key points of control9. The International Classification of Functioning, Disability and Health (ICF-CY) provides a comprehensive view of functioning and constitutes a universal language for interdisciplinary work with children8. It offers a common framework with information on child functioning from medical, psychological, social, educational and environmental perspectives. The ICF-CY is useful as a means for describing the status of children with CP10. The NDT approach has a strong association with the ICF-CY in that it considers children as 'moving targets', changing in all domains over time and seeks to minimise health issues8. Theories of motor control, task-oriented approaches and evidence-based interventions, are optimally incorporated and appropriate credit to sources is given in this pilot study. ❖ Action perception is a function of the patient's ability to perceive their environment. Factors that influence this ability include body size, body control, energy potential and the demands of the task15. The environment may be adapted to enable the patients to hold and maintain grasp of a toy. ❖ The Neuronal Group Selection Theory (NGST)11 offers the perfect balance to promote effective intervention in children with motor dysfunction. According to NGST the ensemble of cortical and subcortical systems is dynamically organised into variable networks, the structure and function of which are selected by development and behaviour. The units of selection are collections of hundreds to thousands of strongly interconnected neurons, called neuronal groups. These groups act as functional units dealing with a specific type of motor behaviour or information from a specific sensory modality. Development starts with primary neuronal repertoires, which then proceeds to selection on the basis of afferent information produced by behaviour and experience. Severely affected CP children experience little functionally relevant activities and have reduced repertoires in spontaneous posture and motil-ity11. Their experiences ca be changed by a variety of activities. ❖ Sensory stimulation is included as daily events and situations are drenched with sensation16. Sensory stimulation consists of activities that promote visual perception, body awareness, tactile perception and visual-motor coordination16. ❖ The advantage of Induced Constraint Movement Therapy (CIMT) and bimanual training17,18 is that the restraint allows the interventionist to focus on and isolate the more affected limb. Findings show that neuro-rehabilitation through the use of CIMT can be effective19. ❖ The brain is capable of recovering after a neurological incident through the ability of neurons and other brain cells to alter their structure and function (plasticity) in response to a variety of external and internal pressures, including behavioural training20. Therefore CP-specific early intervention maximises neuro-plastisity18. Most interventions are presented in specific dosages (strengthening, gait training, or learning to use a power chair) and have as primary focus the changing of body structures and function, activity, or participation outcomes. There is no specified dosage allocated for a holistic approach for children with CP21. A randomised control trial specific for CIMT and bi-manual training synthesis suggests that more practice has proved to be favourable. Specifically, 90 hours over 15 days resulted in better improvement than 60 hours over ten days. A 30-minute session, either twice a day for two weeks or twice a week for at least six weeks, improved endurance and gait speed. Frequency and time spent in treatment appear to be critical to the success of either child- or context-based interventions. Thresholds for time to produce changes in performance (given the variation in age, level of severity, and intensity of work in a session) warrant further investigation. A study using NDT intervention in children with Down Syndrome indicated that children older than 18 months can tolerate interventions for 20-40 minute sessions once every second week for six months22. A One-Group Pre-test-Post-test Design23 was followed. A convenience sample of four children with a confirmed diagnosis of CP made by a paediatric neurologist was used24. Children aged 48.1 to 60 months with a classification of IV or V on the Gross Motor Function Classification Systems (GMFCS)25 and whose parents agreed to comply with the intervention protocol, were recruited for the study from two Centres in Bloemfontein, South Africa. The sample consisted of one boy and three girls. Three participants were diagnosed with quadriplegic CP in GMFCS level V and one was diagnosed with left hemiplegia in GMFCS level IV. Exclusion criteria included botulinum toxin A (BoNT-A) intervention, surgery such as tendon lengthening or other orthopaedic procedures and central visual impairment (as this could influence postural control26). The optimal dosage was determined by the interventionist who is an experienced occupational therapist in the field of CP Previous studies suggested the following dosage: ten days of 60 hours or 90 hours over 15 days or 30-minute sessions either twice a day for two weeks or twice a week for six weeks21.The consented dosage for this pilot was five hours per day of intervention over five days at the Bloemfontein Child Information Centre, resulting in a total of 25 hours of intervention. The participants were evaluated on three occasions (a pre-test and two post-tests) using the Paediatric Evaluation of Disability Inventory Computer Adaptive Test (PEDI-CAT) and the Gross Motor Function Measure (GMFM). Goal Attainment Scaling (GAS) as a measuring tool for establishing treatment goals was completed for the four participants in the intervention group. There was no specific goal identified which was common among the participants. 1. The PEDI-CAT27 measures abilities in four domains: Daily Activities, Mobility, Social/Cognitive function and Responsibility domain. In the PEDI-CAT measures the extent to which the caregiver or child takes responsibility for managing complex, multi-step life tasks. 2. The GMFM is a standardised observational instrument that has been designed for use in both clinical and research settings to measure changes in gross motor function over time in children with CP25. Due to time constraints, the GMFM-66 was used in this study28. The GMFM-66 is an updated version of the GMFM-88 that evaluates 66 items to measure gross motor function in children with CP namely: lying and rolling (4 items), sitting (15 items), crawling and kneeling (10 items), standing (13 items) as well as walking, running and jumping (24 items)25. 3. Goal Attainment Scaling (GAS) is a method for quantifying progress on personal goals using a semi-structured interview29. The GAS detects clinically significant change29 and is an effective way of achieving behavioural change in patients30. 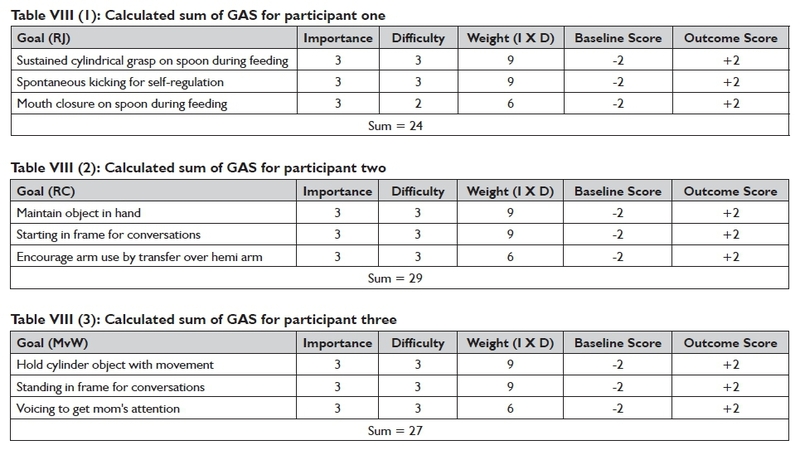 The following three descriptions encapsulate the GAS: (a) a set of goals are specified, (b) weights are assigned to each goal according to priority; (c) a continuum of possible outcomes that could be expected per goal are specified (worst expected outcome (-2)), less than expected outcome (-1), expected outcome (0), more than expected outcome (+1), and best expected outcome (+2)). The GAS's four steps were followed. The first step consisted of identifying the patient's or parent's expectations and the environmental factors influencing the performance of the activity in question for example sustaining cylindrical grasp on a spoon during feeding (Table IV (1) page 30). The second step consisted of determining the observable target behaviour corresponding to the target activity (e.g. holding a toy). Identifying the assistance required to perform an activity, is the third step. Typical assistance requirements were: interventionist assistance, technical aids, assistive devices, verbal guidance and cognitive assistance. The fourth step consisted of quantifying the initial performance of the target activity in terms of the time required. The measurement of the target behaviour can be regarded as a frequency, since as an example, the number of seconds the child needs to hold on to an object is recorded. The five attainment levels were then determined by adding or changing the 'assistance required' and/or 'performance quantification' categories per individual. Only one characteristic at a time was allocated to a goal29(Table I below). An experienced occupational therapist in the field of CP developed an intervention protocol based on Combined Therapy Approaches (CTA) and is summarised in this section. The active and intensive therapy programme for this study was compiled by the interventionist, having a background as a senior Occupational Therapist tutor, certified in paediatric NDT and with clinical neurological experience. Therefore clinical reasoning and prior knowledge played a crucial role in preparing this intervention programme. The programme consisted of high task-specific18 repetitions within a specific context. ❖ Activities of Daily Living (ADL) such as feeding management, dressing in lying and sitting position, mobilisation (to activate muscles and time the sequence of muscles), playing in the standing, side-lying and sitting positions, sleeping and resting, carrying and transferring as well as the introduction of adaptive equipment at home. ❖ The task specificity17 is an active challenging practice, the selected task should not be too easy nor too difficult. The intensity was manipulated by changing the degrees of freedom, speed of movement, loading the objects for strength and or using equipment for arm/leg weight support (by using suspension equipment against gravity), changes in the lever arm, range of motion, endurance (cardiovascular), cognitive and perceptual activities and the frequency of upper extremity use. ❖ Activities should be relevant and meaningful, therefore optimal adaptation to engage motor learning was vital for the activity selection. ❖ The repetition of movement results in improvement in that specific movement; large amounts of practice (different tasks) are required to fully master a motor skill. The principle of experience-dependent neural plasticity and their translation to the damaged brain were incorporated in the intervention31. ❖ Feedback on the outcomes play a pivotal role in creating an optimal learning environment. Therefore, learning requires problem solving not rote (habit/memorised) repetition. ❖ An activity should involve a complete task repetition. It is more effective than executing partial task repetitions31. ❖ Any ability of a specific movement, even small should be implemented in an activity. The "Use it or lose it" and "Use it and improve it" principles were incorporated31. ❖ Occupations should be incorporated on the level of creativity. Visual activities to emphasise accomplishments and awareness of environment were used. ❖ Time allocations to activity participation matters, therefore dosage is important. Dosage should be appropriate to ultimately facilitate relevant responses. The dosage for this study was five hours intervention per day for five consecutive days. The total hours of intervention for each child was 25 hours over the five days32. During intervention the body functions, structures and environment were prepared as well as the adapted equipment necessary within an activity or immediately prior to it. The interventionist followed the child when working within the activity or skill using minimal handling to not interrupt or interfere with the child's ability to achieve a goal independently26. The intervention consisted of the repetition of specific tasks suitable to be integrated in a game-like scenario1, such as reaching for an object which was in a vertical position. Then these tasks were carried over into ADL, play, perception and communication with and without equipment after the hands-on session. Parent and child participation were a priority. An element of motivation and active participation were present for each prepared task of the four participants and the parents. All tasks were selected according to the participants' GAS goals as summarised in Tables IV-VII on pages 30-31, presented in the results section. It is difficult to evaluate the effectiveness of any motor therapy approach4,32, because the specific sequence of treatments that were delivered are not standardised. Previous studies evaluating the effectiveness of NDT/Bobath could also be affected by the skill level of the therapists, which is seldom specified32. The constructs of NDT/Bobath itself have changed over time, and NDT/Bobath strategies are commonly combined with other therapy techniques and medical treatments32. It remains a challenge to obtain unbiased results as there is no definite standardised motor therapy approach yet. The GAS goals for each participant could have been over-cautiously done as reflected in the improved results. The same evaluators were used for the pre-and post-tests and were not involved in any intervention. The data were summarised using descriptive statistics namely median and quartiles. The Wilcoxon signed-rank test is a non-parametric test and similar to the paired t-test when two variables are compared in a single sample33. The data analysis was performed by the Department of Biostatistics of a University, using the software package SAS. The analysis of GAS goals was done independently by a mathematical statistician. Ethical approval from the Ethics Committee of the Faculty of Health Sciences of University of the Free State was obtained prior to implementing this research project (ECU no. 213/2014). Application was done at the NHREC (application ID 3896). Since all the participants were less than 72 months old, written informed consent was obtained from all the parents. Parents were informed that participation in the study was voluntary and that they had the right to withdraw from the programme at any time without prejudice. The GMFM median scores (Table III page 30) showed slight improvement for both post-tests, but did not result in statistical significance (p-value=0.13). All participant's specific tasks with their goals for the intervention group were reflected in Tables IV-VII (pages 30-31). This showed that the goals were attained after five days of task specific intervention. The goal weightings and baselines scores of all the participants are presented in Table VIII (1-4) (page 31 and 32). The sum for this participants were 24, 29, 27 and 29 using the formula of GAS34. T-scores should be distributed around a value of 50 with a standard deviation of 10. The T-baseline score for all participants had improved (22.61 & 22.29 to 77.20 & 77.38)29. The main goal of this study was to determine an intervention protocol which entails actual activities for therapy that could be used in ADL. The intervention during this pilot study was rooted in behavioural training theory20. Task specificity training is recommended for CP as it induces neuroplasticity and functional gains18. The results suggest that task specificity training with intensity, effectively improve developmental outcomes with a positive impact on the motor and ADL developmental domains of the child with CP17,18. Even though not statistically significant, the results showed a positive trend after eight weeks in the gross-motor/mobility developmental domain, social/cognitive domain and activities of daily living (Tables II above and Table III (page 30). The results showed no evidence of immediate, or short- to medium-term benefits once a qualitative change had occurred and after sufficient frequency of treatment4. This pilot study showed sustained improvement for eight weeks. This could be considered as 'learning within a motor learning approach'1. Even though NDT/Bobath offers a forward-looking interdisciplinary (central in the Bobath concept) problem-solving approach, the intervention approach for this pilot study included NDT/Bobath intervention as well as CTA. It was further explored within the scope of Occupational Therapy practice as the foundation. The Dynamic Systems Theory11 was paramount to this intervention, especially with the inclusion of the inclusion of the visual system, which is also not part of NDT/Bobath approach. This pilot study was based on the hypothesis that an intensive holistic intervention approach will lead to functional improvements, with task specificity training17,18. 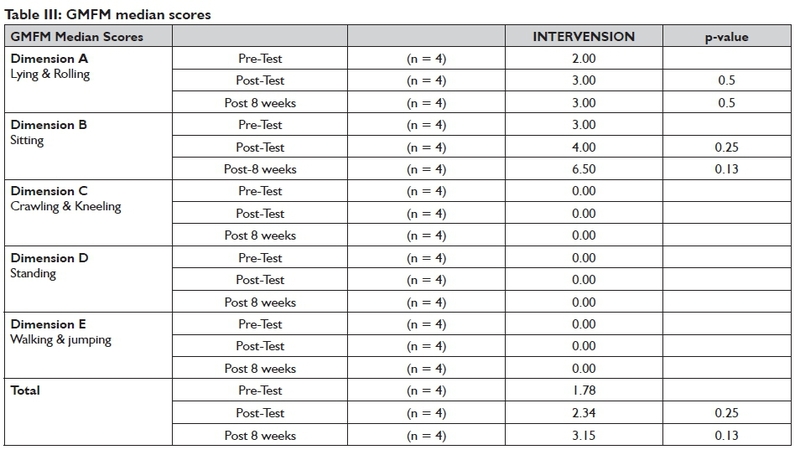 According to the Novak et al.15 review the following interventions were effective for the child with CP: Constraint-Induced, Movement Therapy, Bimanual Training, context-focused therapy, goal-directed/functional training, Occupational Therapy following BoNT-A and home programmes for improving motor activity performance and/or self-care. Our study endorsed the review findings of Novak et al15 ie constraint-induced therapy, context-focused therapy, goal-directed/functional training and home programmes. Completing the PEDI-CAT increased the awareness of mothers of children with CP about their child's progress in relation to typical skill-acquisition patterns and level of assistance provided in daily activities. Using task specificity training17,18 with the involvement of the parents, should be the way forward with intervention of the child with CP. Using GAS goals were an appropriate choice for this pilot study. In this study the T-scores are >5034 and showed an improvement in the participants' development (Table VIII (1-4) page 31 and 32). Although this was a pilot study, the small sample size was a limitation. A further limitation was in the use of the One-Group Pre-test-Post-test Design design23. The maturation with change within the participants could have an effect on the measurements33. The Paediatric Rehabilitation Observational measure of Fidelity (PROF)35 was not used for this pilot study. Even though with no training in the PROF, an observation could be made that the CTP would score well, as the intervention sessions complied with all but five of the 37 non-specific items on the PROF36. Only an occupational therapist as interventionist may be a limitation. An interdisciplinary intervention team including a physiotherapist and speech therapist would have been preferable. This pilot study showed that the Bobath/NDT approach is not the only approach for intervention of children with CP It is recommended that the NDT/Bobath approach should be implemented in intervention sessions incorporating several systems that influence specific tasks, together with targeted functional training. Furthermore, it is recommended to make use of a holistic intervention method of other complimentary treatment modalities and approaches pending on the needs and goals of the child and family. Even though the body of knowledge gained by Bobath/NDT training caters for a holistic approach when intervention is done for the child with CP there is little or no scientific proof of the effect of the approach. Although there is consistent evidence that NDT/Bobath produced an immediate improvement in dynamic range of motion it does not render sufficient evidence of a long term effect32. This study brought to question the level of education and clinical experience of a NDT/Bobath tutor, as well as by whom they were educated. The performance of the patient related to the performance of a tutor or therapist, but to measure this performance needs to be studied. The partnership between the family and the intervention team (occupational therapist) produced better results than excluding them in setting goals13. We hypothesised that children with CP who follow an optimal dosage21 of a holistic intervention will lead to functional improvement in totality. Dosage, in this article includes frequency, intensity, time and type of activity. The findings did indicate that 25 hours for five consecutive days and the task specificity17 as an active challenging practice had a positive functional effect that lasted for eight weeks. This high dosage may be maintainable. This study resulted in the CTP development and the principles may be used in future studies as an intervention protocol for children with CP A follow-up study is needed with a larger sample size using PROF35. As occupational therapists, we are in a unique position with our holistic client-centred approach to manage children with CP successfully. More emphasis should be on dosage of intervention sessions, which includes frequency, intensity, time, type of activity and task specificity. We would like to acknowledge Dr S Capelovitch for support and advice in preparing the protocol. Mr C van Rooyen the Biostat-istician for advice and support on the results. We are grateful to the videographers during this pilot study, Manus Conradie, Faye Campbell, Bronwyn Kemp and Priscilla Taljaard. We acknowledge Johané Nienkemper-Swanepoel for the statistical support of the GAS and the editing of this manuscript.